In the early 1900s, Bat Masterson left the wilds of the West for the bright lights of New York. But the Wild West spirit never really left him. That’s the take of Robert DeArment in his new book Broadway Bat: Gunfighter in Gotham (Talei Publishers, 2006), a biography of Masterson’s 19 years in New York City. 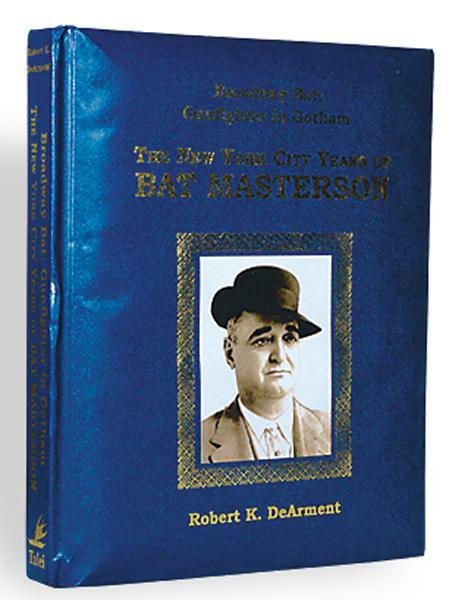 DeArment first released a biography on Masterson in 1979, in which he makes very clear his stand on the lawman: “There is no hard evidence that Bat Masterson ever killed anyone.” In DeArment’s new book, the lawman-turned-sportswriter carries this lack of notches on his six-gun with him to New York City. 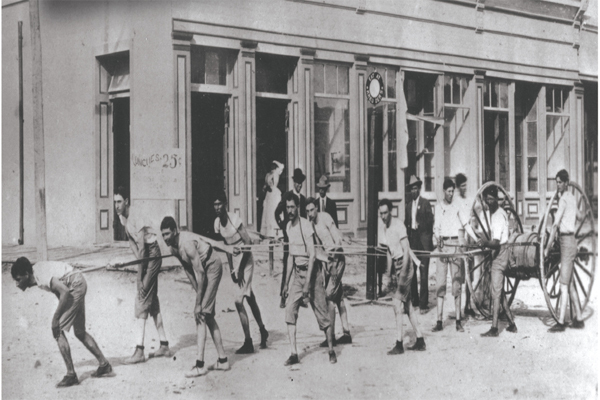 Take the year 1906. Former Creede, Colorado, lawman Richard Plunkett traveled to New York City with a newspaper pal from Texas. 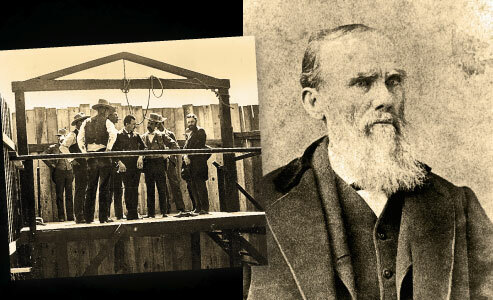 Plunkett was a big, tough customer who gained some notoriety in 1892 for arresting the killer of Bob Ford, the assassin of Jesse James. In between, he—like Masterson—got involved in the boxing game as a promoter and official. The two men knew each other, at least slightly. Masterson was working as a sportswriter for the New York Telegraph and serving as a U.S. deputy marshal for the Southern District of New York. For the most part, he had avoided fights for several years—except for some verbal jousting in the newspaper. Plunkett decided to make the rounds of the Broadway bars, where he proceeded to slam Masterson as a phony. Word got back to the sportswriter, who picked up the challenge and tracked the man down at the Waldorf-Astoria Hotel’s watering hole. 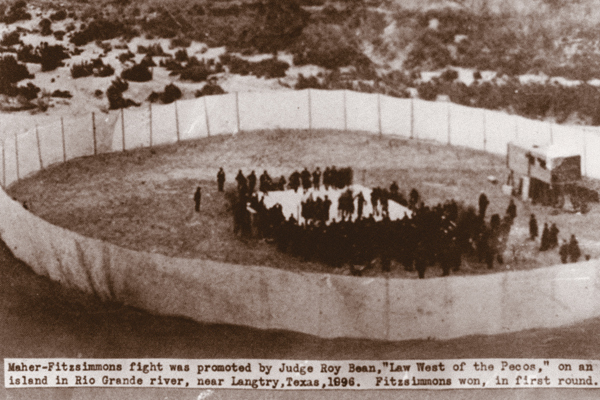 Masterson grabbed Plunkett’s coat and suggested that they go outside (pretty bold for a 53 year old who was much smaller than his opponent). Plunkett didn’t resist. But Plunkett’s Texas friend did—taking a wild, drunken swing at Masterson that missed by a mile. Masterson’s aim was better, and the Texan was knocked senseless by the punch. Masterson then stuck his hand in a coat pocket and shoved something hard into Plunkett’s gut. Someone cried out, “Look out! Bat’s going to flash Betsy!” Everybody ran for the doors to avoid the anticipated gunfire. At that point, a house detective arrived on the scene and told Masterson and Plunkett to leave. After Masterson got out of sight, Plunkett resumed his badmouthing. After serving as a lawman in Kansas, Bat Masterson (inset) partnered up with Wyatt Earp and Luke Short at the gaming tables of the Oriental Saloon in Tombstone in 1881 (shown here, with firefighters in front). He supposedly learned his gambling ways under the tutelage of Earp. Masterson still bet on horses and fights when he moved to New York City to become a sportswriter for a daily paper. He died of a heart attack while working at his typewriter in 1921. For more information about Robert DeArment’s book, Broadway Bat: Gunfighter in Gotham, contact Talei Publishers at 808-395-9600. 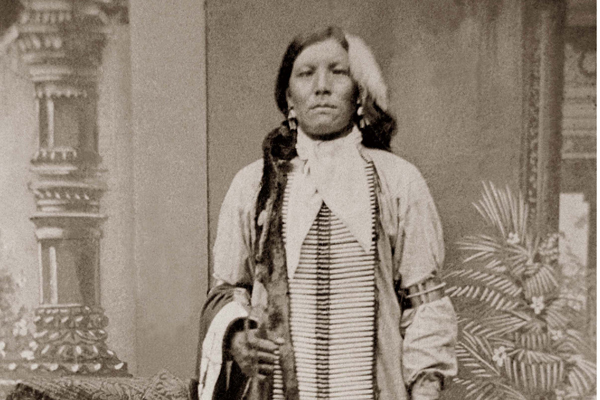 The Return of Crazy Horse Two new biographies claim to tell the full story of this Custer-conquering chief. The Prince of Hangmen? In the shadows of the scaffold, the truth comes out about famous executioner George Maledon.